This loaded 2017 Subaru Outback Touring model arrives on trade from our Volvo facility in very good condition with 28,365 miles. 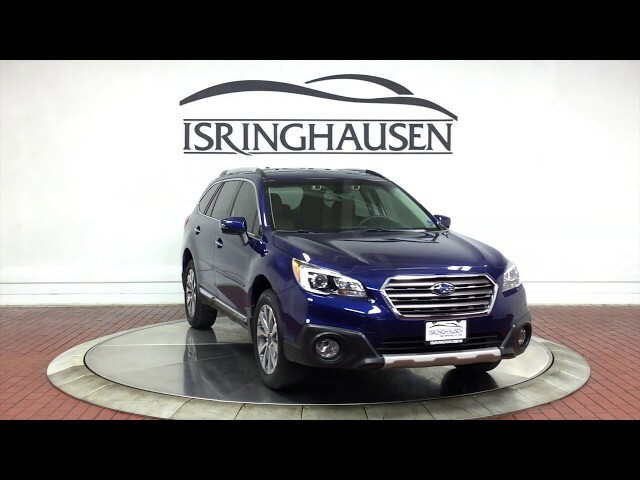 It has a beautiful color combination of Lapis Blue Pearl with Java Brown Leather Interior and factory options including Navigation System, Rear Camera, Subaru Driver Assist (Eyesight, Adaptive Cruise Control, Blind Spot Monitor), Harman/Kardon Sound System, Exclusive 18" Wheels and more. With legendary 4-wheel drive capability and safety, the Outback has become one of the best all around utility vehicles for any situation. Contact a Pre-Owned sales specialist today by calling 877-362-9715. Isringhausen Imports is Central Illinois' premier new car, used car and certified pre-owned (CPO) dealership for quality BMW, Porsche, Volvo and Mercedes-Benz vehicles. At Isringhausen Imports, we have become a leader in the industry by working each day towards the greater good of our customers, our fellow employees, and our community. Radio: Subaru Starlink 7.0" Multimedia Nav System -inc: AM/FM Stereo HD Radio w/single-disc CD player, MP3/WMA/CRR/RW file capability, multi touch gesture high resolution 7.0" LCD display screen, voice activated controls, Bluetooth audio streaming connectivity, Bluetooth hands-free phone connectivity, Bluetooth hands-free text messaging connectivity, iPod control capability, SMS text messaging capability, SiriusXM all access radio (subscription required), SiriusXM traffic (subscription required), SiriusXM travel link (subscription required), dual USB port, 3.5mm auxiliary input jack, rear in glass audio antenna and roof mounted audio/satellite and connected services antenna, Aha The Aha app on your phone allows you to easily access and organize your favorite content from the web into personalized, live, on-demand stations, Once you download the app and organize your stations, Aha syncs to the audio system in the vehicle, The in-depth interface allows you to choose several internet radio stations, newsfeeds, audiobooks and more, You can even get audio updates from Facebook and Twitter StarLink enrollment cannot be applicable to Fleet Management Companies (FMCs) or to Commercial fleet accounts at this time.